How can anyone be in love with a stretchy, tasteless protein composite? 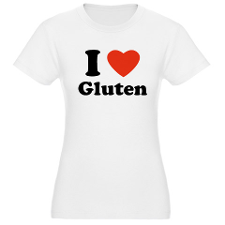 The more time I spend as a carefree coeliac, the more I encounter the strange phenomenon of glutevangelism. size because my sides are splitting. You know them: the jokers who rib you with, "but I love gluten, gluten's my favourite". They've chanced on a hilariously ironic twist on the modern vogue for fad diets, and you can bet they will flog that gag to death. But leaving aside for a moment the vast potential for offence, isn't glutevangelism a little weird? 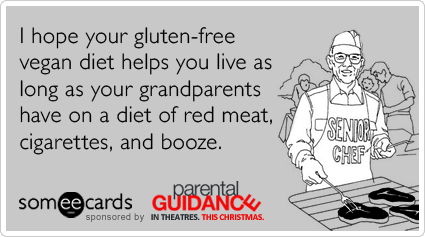 Before I found out I needed to go gluten-free, I can't say I gave any thought to gluten. I don't think I even knew what it was. So I find it bizarre to hear pro-gluten jokes when I whip out my lunch in front of certain non-coeliac acquaintances ("looks tasty...but needs more gluten!"). Food protectionism is a confounding thing. It's as though the gluten-free movement has awakened an awareness of gluten in the world, and now a subset of people - despite no previous awareness of gluten - have latched on to the concept in a rabidly negative way. "Don't take my precious gluten away!" they seem to cry. "I don't know what it is, but if it's in cake then it must be good, right?" Food that is free from anything - whether it's sugar, dairy or the big G - ignites suspicion. Most often in people who don't know much about food. Yes, gluten's properties make your bread springier and dough easier to roll - but gluten-free food is hardly an attack on your human dignity. Paella, Thai green curry, galettes, Indian food, sushi... so many naturally non-gluten-containing delicacies are free from suspicion until someone describes them as gluten-free. For some reason, this label (with its associations of mystery illnesses, allergies and gasp, potential faddiness) provokes negativity in a subset of people. It differentiates these usually familiar food items from the norm. This is where the fearful response comes in: "Gluten-free?" they gasp, "eurrrgh, give me a plate with more gluten!" So much unnecessary social baggage for a term which should be a perfectly ordinary descriptor! But sadly, many people seem afraid of food that veers away from the accepted. That peer pressure and conformity is an issue at the dinner table makes me sad. Food is meant to nourish people's bodies and tickle their tastebuds. Food is your own personal fuel, so mockery of a person's menu is cuttingly personal. Any foodie knows that good food is good because it's nourishing and delicious to the person eating it. There's no objective scale of superiority between meat platters or vegan feasts, allergen-free menus or shellfish deep-fried in peanuts with a dairy-based sesame dipping sauce. The only measurable thing is the effect of a food on the person eating it: on their physical well-being, on their mental health, on their feeling of satisfaction. Judge it on its own merits, open your mind to different flavours, textures and techniques...and ease up on the glutevangelism.